With Ballymena still in the hunt for a European place, Ballinamallard boss Whitey Anderson rejected any talk that there might be any lack of bite about this Saturday’s trip to the Showgrounds. Ballinamallard registered a 4-2 victory against the Braidmen the last time out, but Anderson pointed to a major change in the landscape since that victory, the David Jeffrey factor. 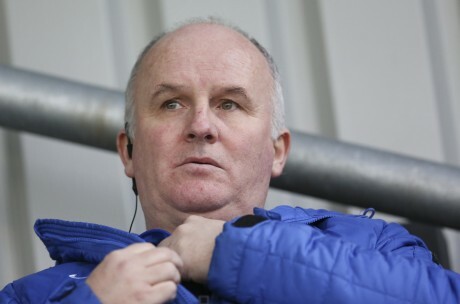 The former Blues boss return to management in March has seen him turn around the fortunes of Ballymena and made them much more formidable opposition. Those changes are recognised by Anderson’s captain, James McKenna as the club continues their battle to keep Premiership football in Fermanagh. “Ballymena are unbeaten since Jeffrey came in so they’ve obviously got a massive lift with the new manager. They’re a different side altogether and it’s a credit to him in fairness. They were in freefall before Jeffrey came in, but they’ve got some results in some great places like Crusaders and Cliftonville. “Certainly we have nothing to fear from Ballymena or any other team in the bottom six. It would be nice to get it done with a game to spare, but I wouldn’t bank on that happening. We have to go 100 percent at every game and they will be looking to continue the good run they’re on. “It’ll be a 50 50 game. We’ve had indifferent results against Ballymena lately. We’ve beat them, they’ve beat us, but we certainly won’t fear going up to play there, it’s a game we’re looking forward to. One major positive is that the Mallards make the trip to mid Antrim having rediscovered their goal scoring touch with two against Warrenpoint at the weekend. McKenna believes that change of scoring fortunes has been coming for a while. “It’s no secret scoring goals has been our problem, probably for the past three years since Andy Crawford retired,” said the Mallards captain. “You look at other teams in the league and they’ll have one or two players on 15 plus goals. Even teams around us have strikers sitting on 15 plus goals. There’s no doubt we’ve struggled in that department. “But in my opinion, with the additions we made at Christmas when three strikers came into club and we’ve young Ryan Mayse flying at training, I think that we carry a goal threat now that we maybe didn’t have all season. Depending on how the injury situation evolved against Dungannon last night, Whitey Anderson should have a full squad to choose from for Saturday’s Showgrounds date. Ivan Sproule will be back from suspension and Alvin Rouse should have a solid week of training under him and that should see him available for selection. Elsewhere Shane McCabe picked up a slight knock against Warrenpoint and is a slight doubt for the weekend.